If Inside Llewyn Davis is the poisonous view of the hardest and most demoralising sides of the music industry, with all its rejection, squalor and misery, then Begin Again is the antidote. They are from different sides of the tracks and share nothing but a basic premise and the same city (New York) in common. 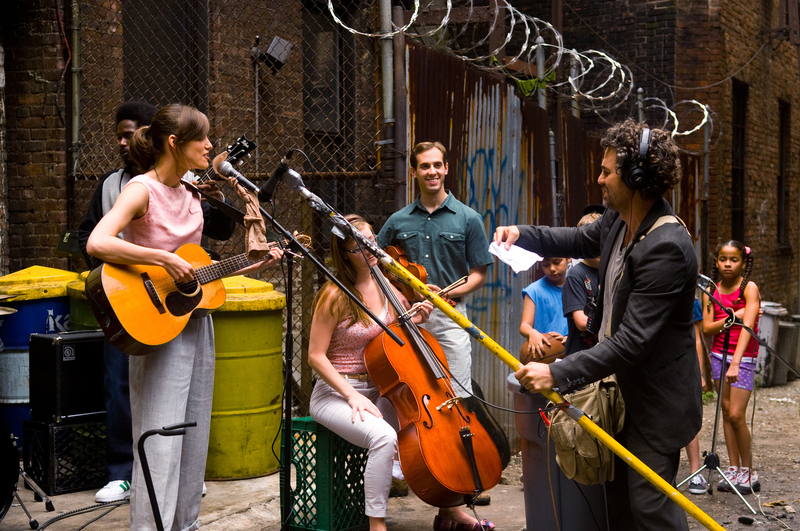 Begin Again tells the intertwining stories of two people whose lives have been ruined by the music industry. Dan Mulligan (Mark Ruffalo) has been sacked from his own record company by co-founder Saul (Mos Def) and has taken to the bottle to avoid finding focus in his life, much to the detriment of his relationship with daughter Violet (Hailee Steinfeld). He has a chance meeting in a bar with Gretta James (Keira Knightley), who has plenty of talent but no stage presence or confidence. He decides she has enough potential to turn into something more than just a singer at an open mic night, though her reluctance is powered by the recent breakdown of her relationship with Dave Kohl (Adam Levine), now seemingly destined for stardom. Everything falls into place perfectly easily. Hurray. Begin Again falls down where films like Inside Llewyn Davis or Carney’s last film Once succeeded for the simple reason that the songs and performances simply aren’t as good. Keira Knightley has found herself in an awkward situation. Her fame ultimately puts her as an a-lister actress and celebrity, with the ability to elevate an average film to blockbuster status due to her past successes. As a viewer, subconsciously there is an expectation that her ability as a musical performer should match that. Sadly, the studio has had this well in mind and ensured, through post-production, that her voice and entire backing track is polished to perfection, removing the intimacy seen in Glen Hansard and Markéta Irglová’s raw but powerful performances in Once. It’s an inevitable source of frustration as it is evident she has some talent, though what that is feels hard to decipher. Ruffalo’s performance lacks conviction and the feeling that he has been really scorned by the music industry never fully materialises. Adam Levine plays his part coolly, almost as an exaggeration of his real-life personality (or what it is perceived to be). Steinfeld provides another assured performance in her supporting role, even though she doesn’t look like she’s ever picked up a guitar before. James Corden makes the most of his limited screen time. It’s disappointing that overall this film fails to deliver on so many levels. The one thing it will be remembered for is the track “Lost Stars”, which was nominated for the Academy Award for Best Song in 2015. It is the one song here that stands up to those around which Once was built. However, one song does not a musical make; it is very unlikely this will follow its predecessor onto the West End and thus it is destined to be forgotten. Begin Again is available for purchase now, or can be streamed on Netflix. After listening to the excellent Masters of Cinema Cast discussion on Busby Berkeley’s 1943 musical extravaganza The Gang’s All Here, I knew I had to watch it for myself. I didn’t know what to expect and having watched it now I still don’t really know what I made of it. I was reminded of a few modern day film-watching woes as the film played out. You know when you’re watching a 2D film at home and for some reason they have these annoying and hard to follow fast-paced sweeping shots following someone through a surprisingly tricky pathway full of things jumping towards you, and you sit there unimpressed because you aren’t at an IMAX screening? There was a great one in the Jim Carrey-starring animation A Christmas Carol. Out of context it just doesn’t wow, because the sole purpose of it is to show off a piece of technology or visual effect. Another example is the 30-ish minutes of wasted special-effects shots in Star Trek: The Motion Picture. Loads to see, if your thing is watching outdated effects showing a spaceship slowly crawling through space. In the distance. But watched in 2015 you can’t help but drown in the lethargy of it all. So we have The Gang’s All Here. A work of Technicolor wonder. A flimsy plot serving as a platform for countless big hit parade smashes in state-of-the-art colour film. A picture oozing razzmatazz. A picture that just doesn’t wow, simply because the visuals it spends so long showing off are just something we expect of a modern film. That’s not to say The Gang’s All Here is the first colour film and a massive surprise to audiences. Indeed, they had been treated to both The Wizard of Oz and Gone With The Wind in 1939, some four years eariler, both shot in Technicolor. This was, however, Berkeley’s first feature to be filmed entirely in Technicolor, which would have been a great honour at the time due to the high production costs associated with the technique. It wasn’t an opportunity he was going to waste, and he certainly made enthusiastic use of his chance to use colour for the first time. Really, the plot is a duplicate of far too many films of the era: woman and soldier fall in love in a whirlwind romance on the eve of his departure for the war (in this case, he’s off to Japan). It really isn’t important. What the 1943 American audiences wanted was escapism – two hours of over-the-top dance numbers, busy routines, familiar songs and huge stars. And that’s what they got. There are a few numbers where Berkeley really goes to town. The big opening number “You Discovered You’re In New York” – sung by Brazilian Carmen Miranda – is a sharp comment about wartime shortages. Her other big number “The Lady In The Tutti Fruity Hat” doesn’t hide the fact that it’s full of innuendo (7ft bananas, anyone?) and is probably the most memorable number in the whole film. There are also moments of total surrealism, none more so than the finale “The Polka-Dot Polka”, which is Berkeley indulging in his big budget and experimenting with the Technicolor medium. It’s kaleidoscopic and hilarious and deserves to be seen. It’s not at all a perfect musical, and it hasn’t retained its popularity over the years, for one reason or another. There probably won’t be a stage adaptation, owing to the fact the storyline isn’t strong enough and the wow factor on the big number comes from visual effects that couldn’t be recreated on stage. However, it deserves to be seen in full HD, with attention given to the brightly saturated colours of the original print. Inevitably, Eureka and Masters of Cinema have delivered on this release yet again. The Masters of Cinema release of The Gang’s All Here is available to buy now. Strangely, you can watch the whole film via YouTube below, though the low picture and sound quality just doesn’t do it justice. You can get a flavour of it though.